The campground wasn’t open yet, but people kept coming in. Some were the usual lookie-loos who just wanted to see what was at the end of the dirt road, but some folks were looking for a place to camp. The Big Boss Man told The Man that as camp host, he could choose to let people camp for free, or he could explain the campground was closed and send them on their way. The Man has a kind heart, so he let most of the would-be campers stay even though he was trying to get the campground ready for the opening of the season. 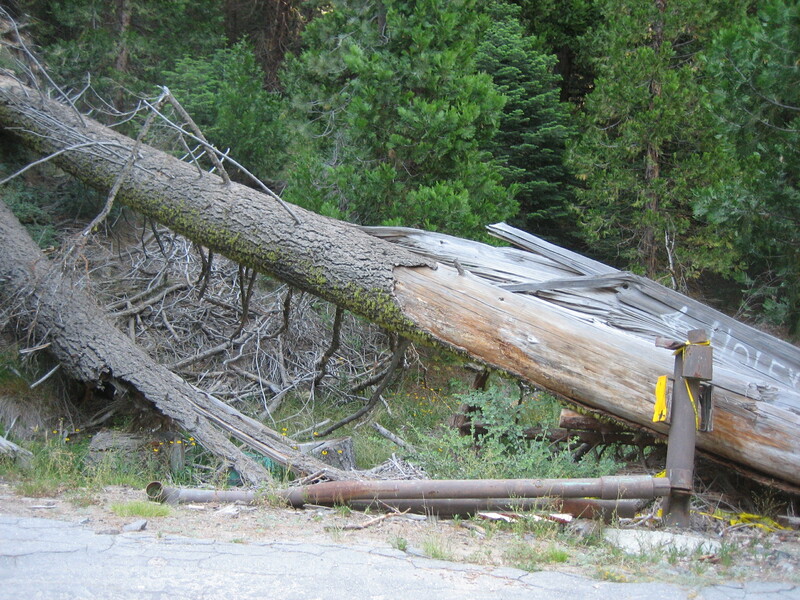 This photo shows the big tree that fell and crushed one half of the gate at the front of the campground. Notice the arm of the gate on the ground. It was easier to keep folks out of other campgrounds that were closed because other campgrounds had big metal gates at their entrances that could be chained shut. The campground where The Man was the host only had a gate. Sometime before I’d ever been to the area, a huge tree fell and crushed half the gate. One arm of the gate would still swing shut, but the other arm was on the ground. The Man swung the one arm of the gate shut one day, and that cut down on lookie-loos a bit, but folks continued to come in looking for a place to camp. It was easy enough to squeeze in between the closed half of the gate and the crushed metal and fallen tree on the edge of the driveway. 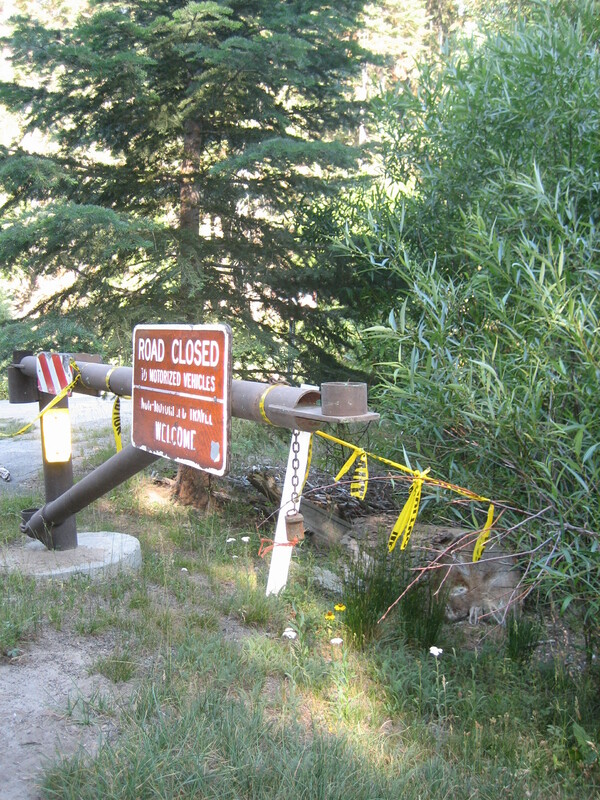 Some people would even get out of their vehicles, open the closed portion of the gate, get back into their vehicles and drive into the campground. People who swung the gate open generally didn’t bother to swing the gate closed. This photo taken in 2015 shows the Forest Service sign on the standing gate. “Road Closed to Motorized Vehicles,” it says. In 2018, the sign was no longer on the gate. 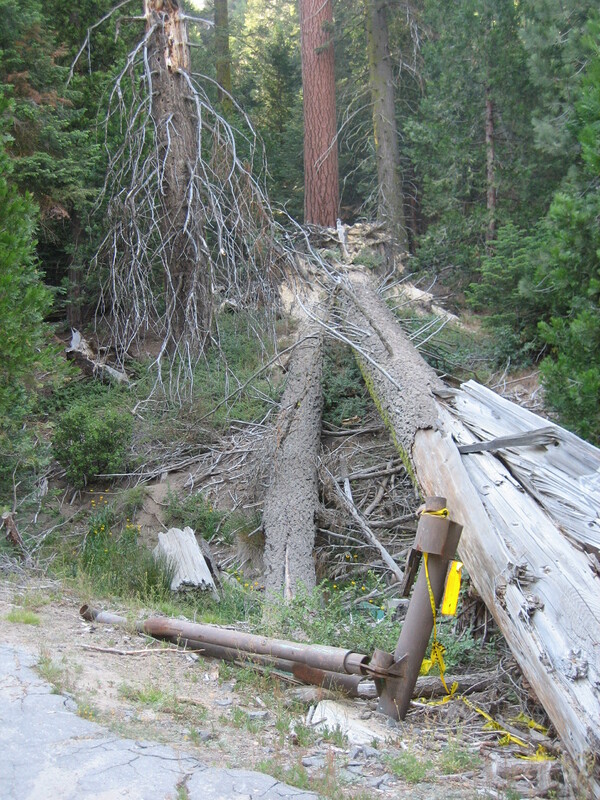 Two seasons before, when I had been the camp host at the campground in question, there was a Forest Service sign on the standing arm of the gate, visible when the gate swung shut. The signs said the road was closed to motorized vehicles but non-motorized travel was welcome. However, when I checked for the sign after The Man swung the arm shut, I realized it was gone. I think someone must have stolen it during the winter. Perhaps a sign would have kept people from driving down the road when half a closed gate didn’t deter them, but I doubt it. The Man did let some people who bypassed the partially closed gate camp. After talking for a while, he invited a nice couple to stay the night. I think the woman was pregnant, he confided in me. We agreed a pregnant person should have access to at least a pit toilet. That couple left the gate open, we discovered later, and a single European man drove into the campground that afternoon. I let him stay, The Man told me after going over to talk to the guy. He didn’t speak a word of English. I suppose it was easier to let him stay than it would have been to try to pantomime campground closed and explain to him where to find dispersed camping. The next morning when I returned from my night babysitting the yurts, I saw the European man making his exit. He’d driven his car to the edge of the dirt road and found half of the gated closed. Instead of driving out on the side of the road with no gate, he had opened the closed arm. When I approached, he was still outside his car. He knew I’d caught him immediately after the act of opening the closed gate, and he looked hella guilty. Instead of getting in his car and driving away, he did some nervous pacing in circles, as if he was unsure of what to do. The road into the campground is only wide enough for one car, so I waited patiently on the main road for the European man to pull out before I pulled in. He finally got into his little white sports car and drove away. After I entered the campground, I got out of my van and closed the gate behind me. About a week and a half before the campground officially opened, The Man discovered someone had stolen the heavy steel fire ring from site #1. He decided he didn’t want anyone coming into the campground while we were down in the valley, so he came up with a plan as we were leaving. Once I pulled the van past the gate, he got out and not only swung closed the half of the gate still standing, he dragged the downed arm across the rest of the entrance. The blocked road should let people know the campground was closed, we agreed. We spent one night in town, returning late the next afternoon. The blocked driveway was a slight pain in the neck when I left in the evenings to spend the night with the yurts, but it was worth it to have a day off in peace in the still-closed campground. After our two days off, it was back to work for us. The Big Boss Man asked The Man to get the group campground ready for campers, so that’s what he spent most of the day doing. I sat in the van and reconciled the money I’d collected from the iron ranger over the last several days. We got back to our campground early in the afternoon. When we pulled up to the gate, we saw the large piece of metal The Man had used to block the entrance was pulled to the side. Someone had moved his barrier! As I drove down the narrow dirt road, a white pickup truck came flying from the depths of the campground like a bat-out-of-hell. I pulled off the road as far as I could so the truck could (hopefully) get past my van, but then the truck pulled off the road too. So I pulled back onto the road, then drove up next to the white pickup truck. The driver rolled down his window. He was a young guy, probably no more than 30. The woman in the passenger seat was young too and wore a ball cap with a ponytail passed through the opening in the back. She kept her face turned toward the window facing the meadow, acting as if she were very interested in examining its every detail. Never once did she look in my direction. The campground’s closed, I told the driver. It won’t be open until Memorial Day Weekend. Are you the host? he asked me. He is, I said, gesturing to The Man sitting next to me. We saw your camp, the driver said. The campground’s closed, I repeated. There should be a sign! the young man said, probably to distract me from the fact that he’d not just crossed a barrier so he could enter a closed campground, but had in fact moved the barrier in question. There used to be a sign, I explained, but now it’s gone. I think it was stolen. That’s why we had the gate closed. The woman in the passenger seat continued to study what must have been the most interesting meadow in the world. After wishing the people in the truck a good day, I drove the van deeper into the campground. The driver of the trucked pulled it out onto the highway. A sign, huh? A 150 pound piece of metal didn’t discourage him from entering the campground, but he wanted me to believe a sign would have done the trick?